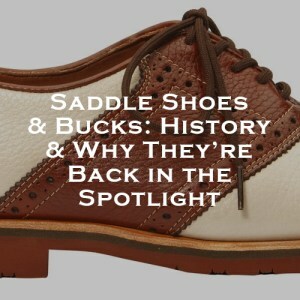 For the better part of the last 150 years, saddle shoes and bucks have been staples in men’s footwear. Known for their classic style with a touch of whimsy, both shoes add a fun, masculine edge to both casual and formal looks. Despite their roots in the late 1800s, these shoes are just as relevant today as ever. In fact, a new generation of men are discovering their style benefits. If you’re scratching your head and wondering what a buck is, you’ve probably seen them even if you don’t know them by name. A buck is a more casual dress shoe. It’s an oxford shoe that’s typically made of suede and has a brick red sole. Saddle shoes are probably the more familiar style of the two, mainly due to their bolder color and pattern. The most traditional saddle shoe is a low-heeled oxford in white leather. The saddle style is defined by a contrast-colored leather piece that’s stitched across the shoe’s instep, usually in black. The first saddle shoes on record date back to 1906. They were originally intended for indoor sports. The reinforced instep was designed to provide extra support for strenuous activity. Young golfers latched onto the shoe style in droves. And when the popular Jitterbug and Lindy Hop dances spread like wildfire, the dancers were often seen in saddle shoes. Unlike bucks, saddle shoes were popular with both men and women and reached peak popularity between the 20s and 50s. For quite some time, both bucks and saddle shoes were novelty shoes. For the guy who wanted to stand out from the crowd and add a classic touch to his style, both shoe types were style moves that were relatively untouched by modern men. However, in recent years, both bucks and saddle shoes have reaffirmed their places among fashion’s most in-demand shoes. In the early 2000’s, men’s fashion had a renewed obsession with the brick red sole. AMC’s Mad Men ignited America’s appetite for Americana style. Though the series is often credited with the resurgence of the pocket square and classic men’s suiting, the show could also be partly responsible for a return to 50s and 60s-era footwear. Soon, every mid-market brand and designer was rushing bucks of every color to the market. Today, they work as a great alternative for guys looking for a shoe that effectively maintains the space between dressy and casual. The suede fabrication offers a slight touch of refinement to any look without feeling too stuffy. Even more popular than the buck is the saddle shoe. Originally, saddle shoes lived on out of necessity. To date, they’re still an asset to golfers worldwide. They offer the right amount of support over the course of 18 holes, and they fit the aesthetic of golf courses and country clubs. They’re functional without sacrificing style. Additionally, saddle shoe experimentation has caught the attention of hipsters everywhere. Playing on the classic white and black styles, brands started to offer colorful updates on the classic shoe. There were brown leather shoes with blue saddles, brown leather with pink saddles, white leather with yellow saddles… pretty much any color combination you could think of. The traditional shoe had started its third act thanks to the endless possibilities in design. Now, regardless of budget or aesthetic, there’s a pair of saddle shoes out there for every guy. T. B. Phelps offers an expertly curated selection of saddle shoes and bucks that evoke classic men’s style with a modern twist. OurDenver Bison Leather Saddle Shoes are made of the most durable, long-lasting bison leather. The David Oxford Saddle Shoes spin the classic design on its head by using a brown contrast color in place of black. And our Spencer Suede Sport Buck Shoes are perfectly geared for comfort, function and casual style. Both bucks and saddle shoes started out as classic Americana footwear with feverish followings. Now, they’ve been resurrected from nostalgia picks to essential modern fashion. Whether you’re hoping to channel your stylish forefathers or pull together a versatile casual look, bucks and saddle shoes are the perfect choices.